Newly tilled fields at the open house at Moose Hill Farm in Sharon. SHARON — In the 1940s, a herd of brown-and-white Guernsey cows produced the milk that made Moose Hill Farm a well-known local dairy. The cows went the way of many local farming operations, but the land was preserved and donated to the Trustees of Reservations. The farm lay quiet for years. Then, this spring, with the help of the Henry P. Kendall Foundation, the emerald-green fields lined with stone walls were reborn into agricultural use. The farm was alive with friendly voices as families gathered for an open house recently to welcome the new operation. A field had been planted with onions, leeks, peas, and fava beans, and more rows looked freshly plowed, the earth still dark and moist. The 96-foot-long greenhouse was filled with seedlings. Flats of baby greens were hardening off outside, waiting for transplanting. 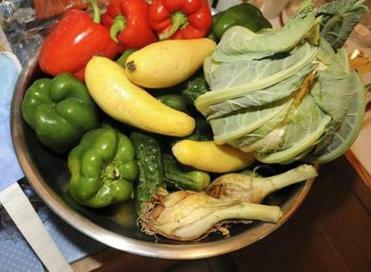 CSAs and other outlets for locally grown food are rising in popularity. Children gravitated to a flock of some 300 golden-red chickens — golden comets — whose electric fence had been turned off to encourage visitors to touch them. Farm manager Molly DellaRoman and her apprentices welcomed the public and answered questions. The project not only returns the land to farming but also reinvigorates land once owned by Kendall, a 20th-century Walpole industrialist, who acquired the farm and preserved its acreage. In the first half of the 20th century, Kendall had turned an insolvent cotton batting company into an international and diversified business. The company made gauze for World War I battle operations and manufactured bandages under the names Curad and Curity, brands still used today. With a grant of $750,000 over three years from the Kendall Foundation, established by Kendall’s sons and now led by grandson Andrew Kendall, the Trustees of Reservations has opened the farm as a vegetable subscription program, also known as a CSA, for community-supported agriculture. Buyers pay in advance for a season of vegetables and pick up a weekly allocation of whatever is ready — which is expected to start with about 5 pounds a week at the beginning and sometimes rise as high as 25 pounds in the fall, when winter squash are ripe, DellaRoman said. “I think it’s fantastic,” said Erika Miao, who visited from Mansfield with her husband, Paul Miao, and their three children, ages 2 months, 1, and 3. She got interested in CSAs when a friend joined one last year. “I don’t know if I’d use all the vegetables, but I’m looking into it because I feel like we’d be healthier if we had piles of vegetables in our house,” she said. In 2009, the Globe listed 44 CSAs with pickup locations inside Interstate 495, and more local CSAs have opened since then. A national database at www.localharvest.org lists 217 CSAs in Massachusetts. An increasing number of farms offers more than just vegetables, too; some specialize in beef, eggs, fish, pork, or poultry. Moose Hill is the Trustees’ fifth operation; others are at Weir River Farm in Hingham and at other properties in Dover, Beverly, and Ipswich. Last year, 1,200 families each bought a share in a Trustees’ CSA. The organization also operates farm stands and an Ispwich dairy store and participates in farmers markets, where consumers can buy fresh produce without committing to a subscription. Nationally, farmers markets have proliferated, climbing steadily in number since the US Department of Agriculture started publishing a directory of markets in 1994. Last year, the directory listed 7,864 markets, up 9.6 percent from 2011. Locally grown food continues to generate new interest in Massachusetts as well. Last year, Just Right Farm in Plympton began offering farm-to-table dinners, and the farm is now gearing up for its second season. Earlier this year, the first Massachusetts Urban Farming Conference took place in Boston. And in June, West Bridgewater Town Meeting will vote on a right-to-farm bylaw expressing support for farming in the town. Kendall, who served as president of the Trustees from 2000 to 2012 before becoming executive director of the Kendall Foundation, said that less than 10 percent of New England’s food comes from within the region, and that experts believe New England could provide more of its own food — perhaps more than 50 percent. The foundation began concentrating on the issue two years ago. “The foundation’s sole focus these days is on rebuilding the New England food system,” he said. It supports community gardens in Boston, political advocacy through the New England Farmers Union, and a program that doubles the value of food stamps used at farmers markets, among other programs. When it came to Moose Hill, the Trustees’ and the foundation’s goals meshed. In 2005, the foundation gave 347 of the family farm’s acreage, including a family home, to the Trustees. At the time, the goal was preservation of the property. Now, with the grant, Kendall said, he is delighted to see an active farm reestablished on the land. Former Kendall land is also in conservation at Mass Audubon’s adjacent Moose Hill Wildlife Sanctuary. From his previous work with the Trustees, Kendall knew how much money and effort it would take to build a CSA at Moose Hill Farm. The one-time grant could last until the farm is up and running, he said. Steve Sloan, the Trustees’ director for the Greater Boston and northeast regions, said the organization’s CSAs take about three years to break even. In the fourth year, they begin generating income used to maintain barns and care for the property in ways the Trustees might not otherwise be able to do. Two Trustees’ CSAs are making income now, he said, and the rest are expected to do so within the next few years. In addition to vegetables, the farm will sell eggs separately from the CSA, and the Trustees plan to add pork next year and beef the following year, according to DellaRoman. “It’s an ambitious, exciting program with many different facets,” Kendall said. Other CSAs run by the organization have a 95 percent renewal rate and waiting lists, he said. The farm will also connect with youth, both in the Sharon public schools and in the Trustees’ youth corps. The youth corps will help with harvesting, DellaRoman said, and in the fall, the farm will grow vegetables for school salads.